Unique Landscaping has 20 years experience crafting ideal outdoor getaways with landscaping and hardscape design. Unique Landscaping has 20 years experience crafting ideal outdoor getaways using landscaping and hardscape design. Increase your curb appeal and create an outdoor oasis of luxury. Increase your curb appeal and enjoy an outdoor oasis of luxury. At Unique Landscaping we have some of the best hardscape designers in Oklahoma! Whether you need an outdoor fireplace, outdoor kitchen, paver pathway, water feature, pergola, custom deck, or any other kind of hardscape our Tulsa hardscape contractors are ready to add value and curb appeal to your home or business! If you’re ready to make the most of your property and turn your outdoor vision into a reality then you are in the right place. Our Tulsa hardscaping contractors can tailor designs and plans to utilize your space for its maximum efficiency and beauty. When you are ready to begin one of our Tulsa hardscaping contractors will meet with you to plan out the design. Once the theme, materials, and design have been confirmed we will begin transforming your backyard into a luxurious outdoor oasis! Hardscapes are an integral part of any landscape, whether for residential or commercial clients. Whether a home, or apartment buildings, strip malls, office buildings, or motel all buildings can benefit from a beautifully designed hardscape. After talking with you on the phone we’ll schedule a time to send out one of our landscaping architects to meet with you and go over the plans for your property. Once we’ve got a good grasp on your vision for the property we’ll put together a beautiful hardscape design. Once we’ve finished the hardscape design we will get confirmation from you on the layout, selection of materials, and all elements involved in the hardscape design. We’ll give you a firm quote on the project and if you like what you hear then we’ll begin! And if you choose to hire us for the hardscape installation then the design is free! The wonderful thing about hardscape installation and landscape design is that it not only adds to the quality of your life but the value of your property. There are so many options that can be used to enhance the landscape of your home or business. Imagine a new patio with a stone fireplace surrounding by gorgeous landscaping where you can enjoy the outdoors even in the winter next to a crackling fire. Or a pergola for resting in the shade during the summer. 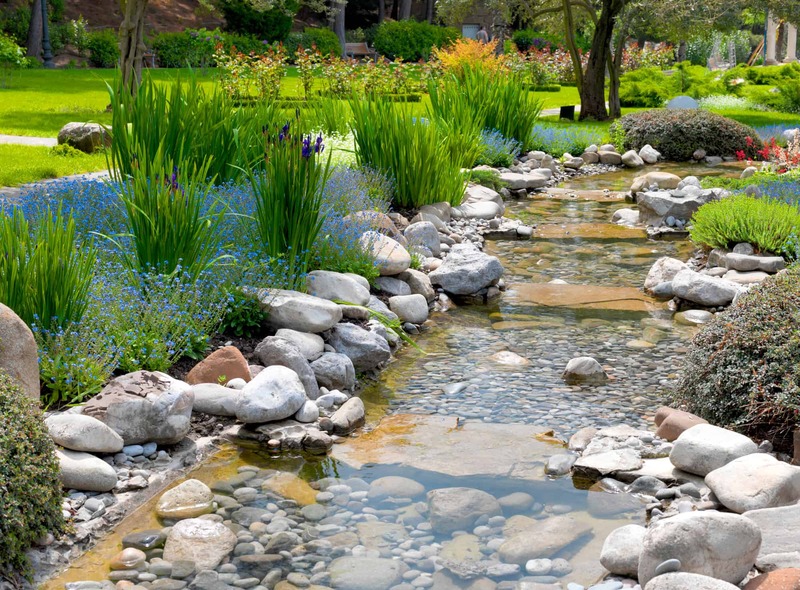 Or maybe you’d prefer the peaceful sound of a waterfall or bubbling brook by installing a waterfall, backyard pond, fountain or some other water feature. Or even better yet, all of the above. You would love getting to host your family and friends for outdoor parties and they would love it too! This doesn’t have to be a dream. All it takes is a single phone call and outdoor luxury can be yours. Call us today!